High Bandwidth Memory needs no introduction. Debuting in the AMD Fury series, to great acclaim, the availability of high bandwidth to an ever-powerful GPU has been a much needed reprieve. HBM1 however, had its own limitations – one of the major ones being a maximum limit of 4GB and a maximum bandwidth of 512 GB/s. All this is set to change with HBM2 – which will introduce sizes up to 32 GB at 1 TB/s, more than enough to satiate the hunger of next generation graphic cards from both Nvidia and AMD. HBM2 will basically double the bandwidth offered by HBM1 – which is quite an impressive feat considering that HBM1 is already around 4 times faster than GDDR5. Not only that but power consumption will be reduced by another 8% – once again over an existing reduction of 48% over GDDR5 (of HBM1). But perhaps one of the most significant developments is that it will allow GPU manufacturers to seamlessly scale vRAM from 2GB to 32GB – which covers pretty much all the bases. 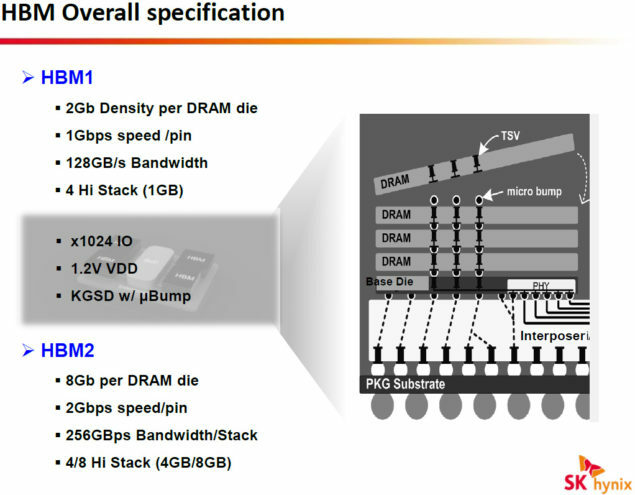 As our readers are no doubt aware, HBM is 2.5D stacked DRAM (on an inter-poser). This means that the punch offered by any HBM memory is directly related to its stack (layers). The impact of memory bandwidth on GPU performance has been under-rated in the past – something that has finally started changing with the advent of High Bandwidth Memory. Where HBM1 could go as high as a 4-Hi stack (4 layers), HBM2 can go up to 8-Hi (8 layers). The 4-Hi HBM stack present on AMD Fury series is basically a combination of 4x 4-Hi stacks – each contributing 1GB to the 4GB grand total. In comparison, HBM2’s 4-Hi stack will offer 4GB on a single stack – so the Fury X combination repeated with HBM2 would actually net 16GB HBM2 with 1TB/s bandwidth. Needless to say, this is a very nice number, both in terms of real estate utilization and raw bandwidth offered by the medium.